On April 29, 2017, Mattabeseck Audubon Society, with the Jonah Center for Earth and Art and the Connecticut Forest and Park Association (CFPA), is pleased to offer a special trip to a variety of significant nearby geological sites. 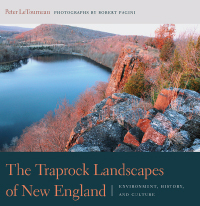 Leading the event will be Dr. Peter M. LeTourneau, author of the recently published book, The Traprock Landscapes of New England: Environment, History, and Culture, and Robert Pagini, whose photographs are featured in this work. The field trip, like the book, tells the story of the hard rock ridges that form the backbone that runs through the center of our state. Topics will include the geology, ecology, and human history of the area, beginning 200 million years ago and concluding with the present crisis to preserve the rocks and protect the unique plants and animals that exist only in the crags and talus of this ancient place. Stop 1: Black Pond state boat launch, Middlefield (Off route 66 near Meriden-Middlefield town boundary). Walking difficulty is moderate, about 1/4 mile on level but irregular and rocky terrain. Stop 2: Giuffrida Park/Chauncey Peak, Meriden. Participants may split into two groups, one up a steep, challenging trail to the summit (<1/2 mile), one easy to lakeside vista and points of geologic and biologic interest (1/2 mile on level but irregular terrain). There is no fee, but please email Alison Guinness at wjguinness@snet.net to register so that we have an idea of the number of participants.